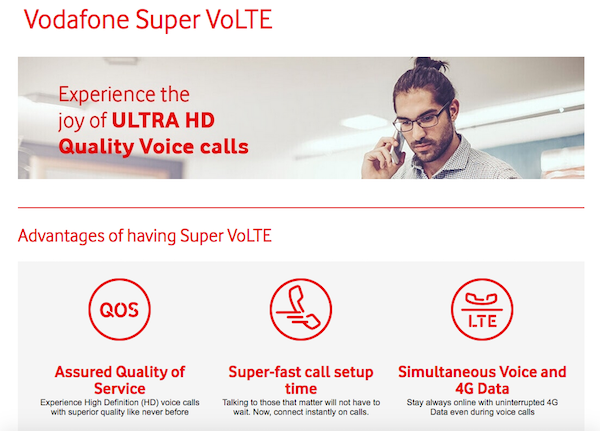 Vodafone India has now announced the expansion of its Super VoLTE services in various cities such as Chandigarh, Mohali, Panchkula, Kharar, Ludhiana, Amritsar, Jalandhar, Patiala, Rajpura, Bathinda, Firozpur, Moga, Hoshiarpur, Pathankot, Batala, Khanna, Phagwara, Abohar, Sangrur, Faridkot, Kot Kapura and Malout in the Punjab circle. With this rollout, Vodafone becomes the first GSM operator to launch VoLTE in Punjab, allowing users to make calls using VoLTE technology. Vodafone Super VoLTE services will be live across the entire Punjab circle very soon, and it will be a phased rollout as expected from the top telecom operator. There are no additional charges for using Vodafone VoLTE services and all calls will be billed as per existing plan or pack benefits. Vodafone is one of the leading telecom operators in the Punjab circle and the VoLTE service rollout will more value to the telco now. Vodafone VoLTE services were recently launched in Maharashtra and Goa, Mumbai, Delhi NCR, Gujarat, Rajasthan, Haryana, Karnataka, UP West, UP East and the company also promised to expand the service across the country in a phased manner over the next few months. The country’ second largest telecom operator is also actively adding new devices to its VoLTE supported smartphone list and now has over 50 devices. why does one need airtel or vodafone volte??? only sarcastic jio haters need it. Samsung probably not supported Vodafone volte in kolkata. Though airtel volte supported in Samsung. I can’t find Vodafone volte in Samsung. Only honor are honouring Vodafone volte. Don’t worry wait a few months Samsung will update the whole line up.